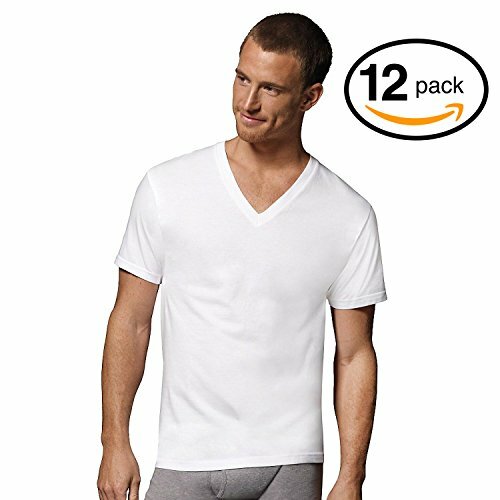 The Fruit of the Loom Men's ComfortSoft White V-Neck T-Shirt is an essential for the wardrobe. It is made with preshrunk cotton for a soft breathable comfortable fit wash after wash. It can be worn under your clothes and features a lie flat tagless collar that will keep its shape. The Fruit of the Loom men's t-shirt has a generous length so that it stays neatly tucked while you move around. White in color, it pairs easily with all types of bottoms. The Fruit of the Loom t-shirt comes in a super value 10 pack and in a range of sizes. Versatile in design, you can use it to layer under other clothing during cold weather or wear it alone with the summer heat hits. Your day goes better when you're comfortable. So, before all else, pull on this Fruit of the Loom super soft undershirt. Lay Flat Collar keeps its shape, guaranteed. Two-ply, rib-knit neckband resists raveling. Roomy armholes allow free movement. Generous length stays neatly tucked.